578 pages | 135 B/W Illus. This is a comprehensive textbook on service systems engineering and management. It emphasizes the use of engineering principles to the design and operation of service enterprises. Service systems engineering relies on mathematical models and methods to solve problems in the service industries. This textbook covers state-of-the-art concepts, models and solution methods important in the design, control, operations and management of service enterprises. Service Systems Engineering and Management begins with a basic overview of service industries and their importance in today’s economy. Special challenges in managing services, namely, perishability, intangibility, proximity and simultaneity are discussed. Quality of service metrics and methods for measuring them are then discussed. Evaluating the design and operation of service systems frequently involves the conflicting criteria of cost and customer service. This textbook presents two approaches to evaluate the performance of service systems – Multiple Criteria Decision Making and Data Envelopment Analysis. The textbook then discusses several topics in service systems engineering and management – supply chain optimization, warehousing and distribution, modern portfolio theory, revenue management, retail engineering, health systems engineering and financial services. Service Systems Engineering and Management is primarily addressed to those who are interested in learning how to apply operations research models and methods for managing service enterprises. This textbook is well suited for industrial engineering students interested in service systems applications and MBA students in elective courses in operations management, logistics and supply chain management that emphasize quantitative analysis. "I am thrilled to see this fabulous book getting published. I have been waiting for several years to offer a course on service engineering but never took the next step. As soon as I saw the contents of this book as well as the first couple of chapters, I got the inspiration to put in the paperwork to offer the course. The book is current, covers a vast set of service industries, goes deep in terms of analysis, focuses on applications of operations research, and is written like a textbook tailor made for classroom purposes. The authors bring in their years of experience into this masterpiece of a book. I am delighted that the authors have an extensive exercise section, several worked out examples, and are offering materials for other instructors. I cannot wait to read it cover to cover and teach the aforementioned course on service engineering. For me this book is the greatest thing since the slice of bread, and the Internet." "This is a well written book by distinguished faculty members in the discipline. The material covered is state-of-the-art and clearly explained. I highly recommend this as a textbook and as a reference book in the newly emerging area in industrial engineering." Service Systems: An Overview. Forecasting Demand for Services. Design of Service. Evaluation of Service Systems. Supply Chain Engineering. Warehousing and Distribution. Financial Engineering. Revenue Management. Retail Engineering. Healthcare Delivery Systems. Financial Services. Exercises. References. A. Ravi Ravindran has been a professor and former department head of industrial and manufacturing engineering at the Pennsylvania State University (1997-2017). He is an Emeritus Professor now. Formerly, he was a faculty member in the school of industrial engineering at Purdue University (1969-1982) and at the University of Oklahoma (1982-1997). At Oklahoma, he served as the Director of the school of industrial engineering for 8 years and as the Associate Provost for the university for 7 years. He received his B.S. in electrical engineering with honors from BITS, Pilani, India, and his M.S. and Ph.D. in industrial engineering and operations research from the University of California, Berkeley. His research interests are in multiple criteria decision-making, financial engineering, healthcare delivery systems and supply chain optimization. 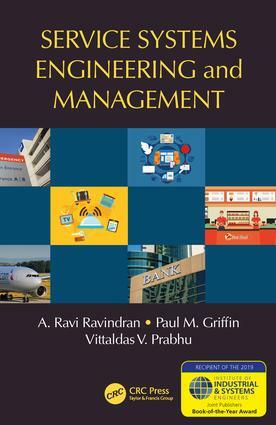 Dr. Ravindran has published 8 books (Operations Research, Engineering Optimization, Operations Research and Management Science Handbook, Operations Research Methodologies, Operations Research Applications, Supply Chain Engineering, Multiple Criteria Decision Making in Supply Chain Management and Big Data Analytics using Multiple Criteria Decision-Making Models) and over 150 journal articles in operations research. His recent book on Supply Chain Engineering received the Institute of Industrial Engineers (IIE) Book-of-the-Year Awardin 2013. He is a Fellow of IIE and a Fulbright Fellow. In 2001, he was recognized by IIE with the Albert G. Holzman Distinguished EducatorAward for significant contributions to the industrial engineering profession by an educator. In 2013, he received the Outstanding Teaching Award in the college of engineering from the Penn State Engineering Alumni Society. He also received the Excellence in Teaching Awardfrom the Logistics & Supply Chain division of IIE in 2017. He has been a consultant to AT&T, CNH America, General Motors, IBM, Kimberly Clark, General Electric, U.S. Department of Transportation, the Cellular Telecommunications Industry Association and the U.S. Air Force. He currently serves as the Operations Research Series Editor for Taylor & Francis Group/CRC Press. Paul Griffin is the St. Vincent Health Chair and Director of the Regenstrief Center for Healthcare Engineering at Purdue University and a professor in the Schools of Industrial Engineering and Biomedical Engineering (2017-present). Previously, he was the Virginia C. and Joseph C. Mello Chair and Professor in the School of Industrial & Systems Engineering (ISyE) at Georgia Tech (2015-2016). Prior to this, he served as the Peter and Angela Del Pezzo Chair and Department Head of Industrial and Manufacturing Engineering at Penn State (2009-2015). He began his academic career as an assistant professor in ISyE at Georgia Tech in 1988. Paul received his B.A. in Chemistry and B.S. in Chemical Engineering from the University of Texas in Austin, his M.S. in Industrial Engineering from the University of Texas at El Paso, and his Ph.D. in Industrial Engineering from Texas A&M University. His research interests are in healthcare engineering, health analytics, cost and comparative effectiveness in public health, and supply chain coordination. Vittal Prabhu is currently a Professor in the Marcus Department of Industrial and Manufacturing Engineering at Penn State, where he started his academic career as an assistant professor in 1996. He also serves as the Director of Service Enterprise Engineering 360. He received his Ph.D. in Mechanical Engineering from the University of Wisconsin-Madison, where he also got his M.S. degrees in Mechanical Engineering and Manufacturing Systems Engineering. He received his B.E. in instrumentation technology from Bangalore University. Vittal works in the area of distributed control systems with a focus on manufacturing and service enterprises consisting of discrete-events, physical processes, and service processes. He teaches courses in manufacturing systems, service systems engineering, retail services engineering, and distributed controls. He is a Fellow of the Institute of Industrial Engineers. He is also an active member of the Society of Manufacturing Engineers and the International Federation for Information Processing - Working Group 5.7: Advances in Production Management Systems.